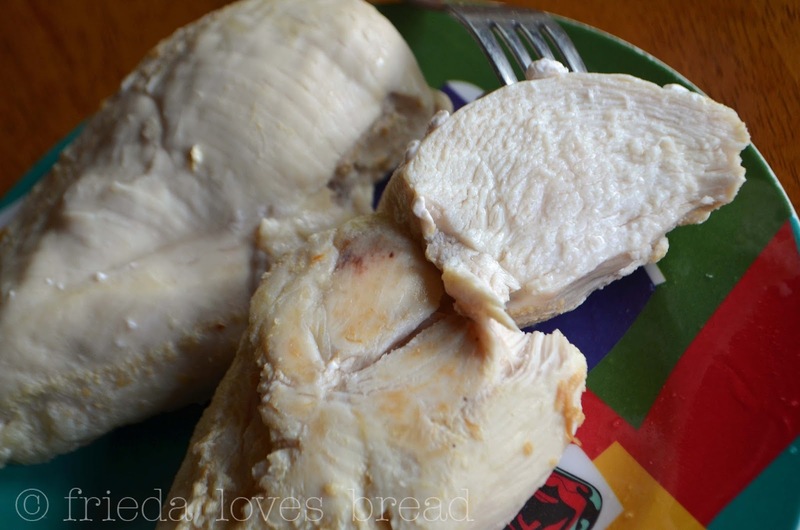 Frieda Loves Bread: Boneless Chicken: Frozen to Fab in Your Pressure Cooker! 0 Boneless Chicken: Frozen to Fab in Your Pressure Cooker! Put frozen boneless, skinless chicken breasts directly into your pressure cooker or Instant Pot for moist, tender chicken, ready to use in your favorite recipes: casseroles, quesadilla, pizza, enchiladas, tacquitos, pasta, salad, soups, or add your favorite BBQ sauce for a hot chicken sandwich. You can slice it, dice it, or shred it. Cooking chicken in a pressure cooker can be tricky. If it is over cooked, it will be rubbery and dry. If it is undercooked, it can be chewy and not safe to eat. I use my FoodSaver to freeze my boneless chicken. In addition to marking the date on the Food Saver bags with a Sharpie, I also put the weight, as it is helpful for not only in recipes, but for cooking times as well. This is a one pound boneless chicken breast weighed on my favorite OXO digital scale. If you are freezing chicken breasts for pressure cooking, freeze them in a single layer or in individual portions for best cooking. Cooking frozen chicken doesn't require a lot of water, so I use 1/4 cup water or chicken broth and put the frozen chicken breast on top. I love using Better Than Bouillon for this and many of my recipes. It is important to keep your chicken in a single layer, or use a tall trivet or steamer basket to separate layers of chicken so they are not stacked right on top of each other. If you don't have a trivet, try to scatter the chicken so they are not stacked on top of each other. If your chicken breasts are stuck together in a solid block, it's best to separate them. Run the frozen chicken under running tap water and pry them apart. The cook time formula that I use is 1 minute per ounce, with a 10-15 minute natural pressure release (NPR). If chicken is over cooked, it can taste dry and chewy. If you have chicken in varying sizes, take the average weight of the chicken and use that for your cook time. Select High pressure and 16 minutes for this 1 pound chicken breast. Make sure your pressure valve is closed! 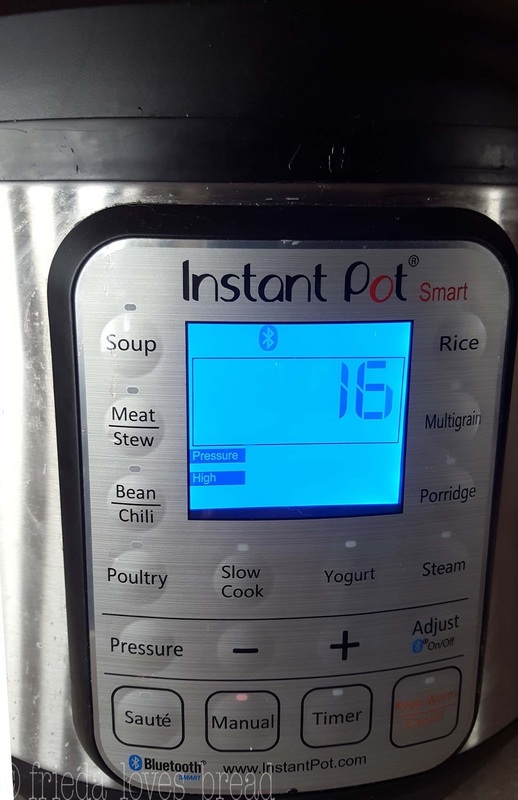 At the end of the cook time, let the pressure cooker naturally release by waiting 10 minutes. At the end of 10 minutes, open the pressure valve to release any remaining pressure, and open your cooker. 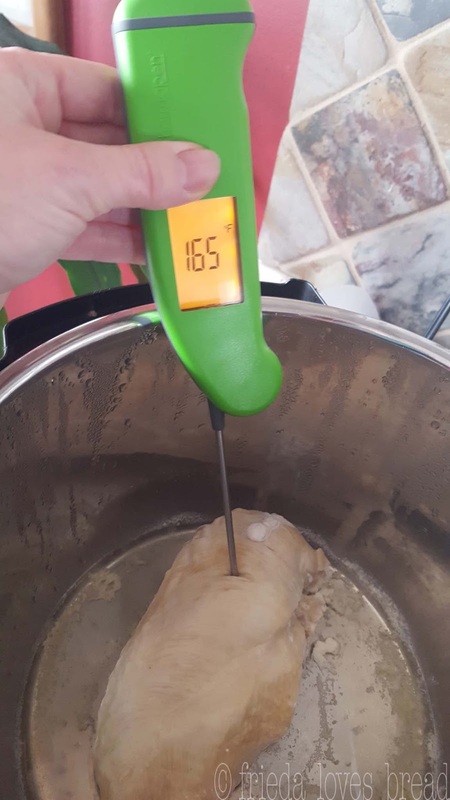 Take the temp of your chicken by inserting an accurate thermometer (I am using my Thermoworks Mk4) in to the thickest part of the meat. You want your internal temp to be 165°F. 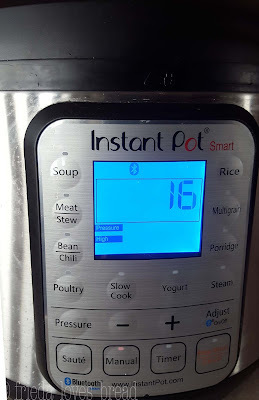 The first time I took the temp, it was 160°F, so I closed the pressure cooker and waited another 5 minutes. Took the temperature again, and it was a perfect 165°F. When you cover your meat, it is still continuing to cook, and the temperature can go up as much as 1 degree every minute. I measured the amount of liquid remaining in the pot. I started with 1/4 cup chicken broth and ended up with nearly 3 oz, or 1/3 cup. You can save this broth and use it in your recipes. To shred your chicken quickly, cut it into large chunks and put it in the bowl of your mixer. 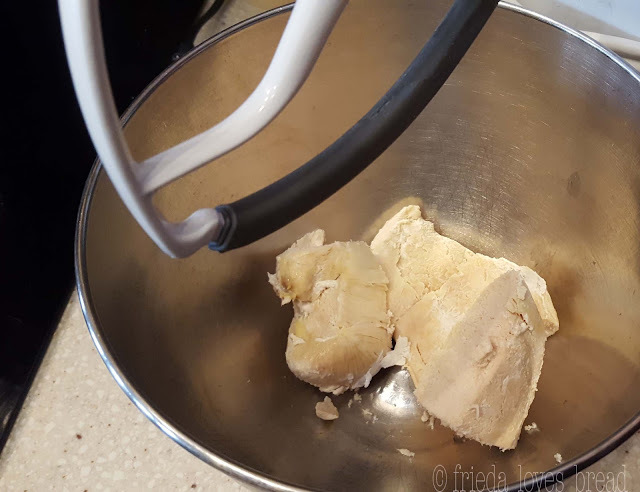 If you have a hand mixer, you can do this directly in your stainless steel pressure cooker pot. You can shred cooked chicken, beef or pork as well! Use the flat blade if you have a Kitchen Aid stand mixer, and use a low speed. 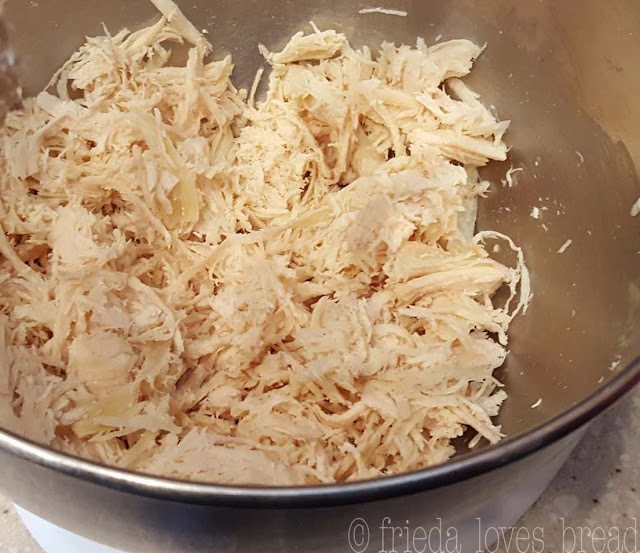 In seconds, you will have shredded chicken, ready to use! You can freeze your cooked chicken by putting cooled chicken in a freezer safe bag, rollin it up to remove excess air, or by using a Food Saver. 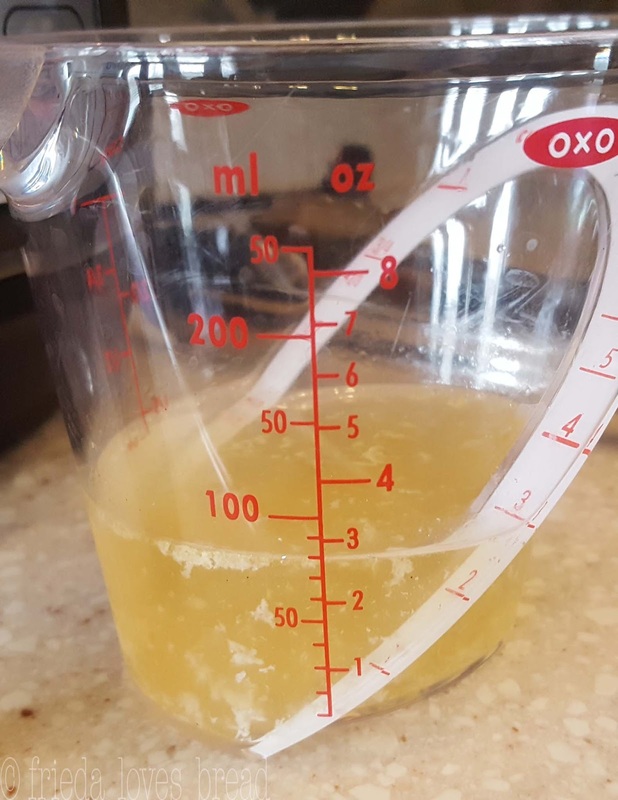 You can even add some of the remaining chicken broth left over from cooking to keep your chicken moist during freezing. Cooked chicken will keep well in the freezer for 4-6 months. Check out my other Frozen to Fab recipes! 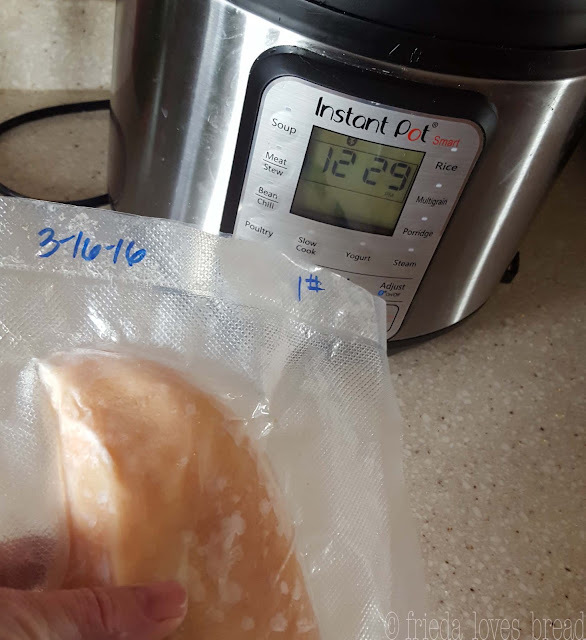 Use your pressure cooker to quickly thaw & cook your boneless chicken breast. Use a thermometer to make sure the internal temp at the thickest part reads at least 165°F. 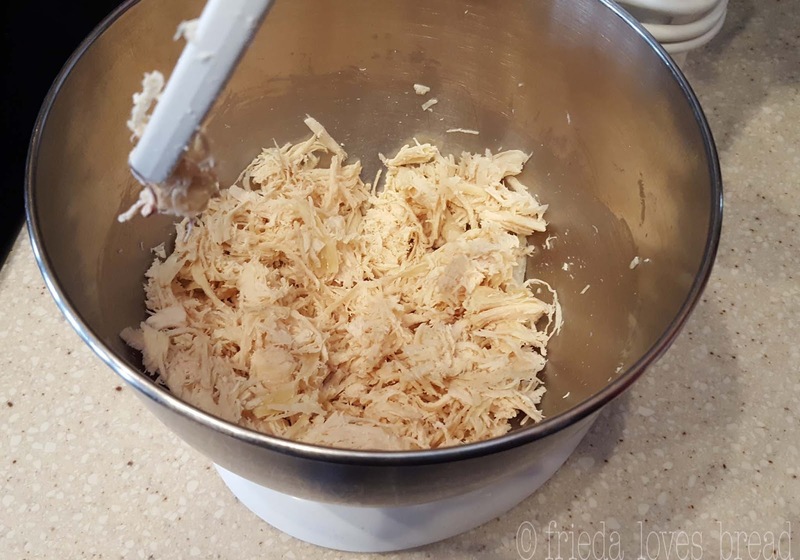 Use your electric hand or stand mixer to quickly shred your cooked chicken. 1. Put 1/4 cup of water or chicken broth in the pressure cooker pot.2. 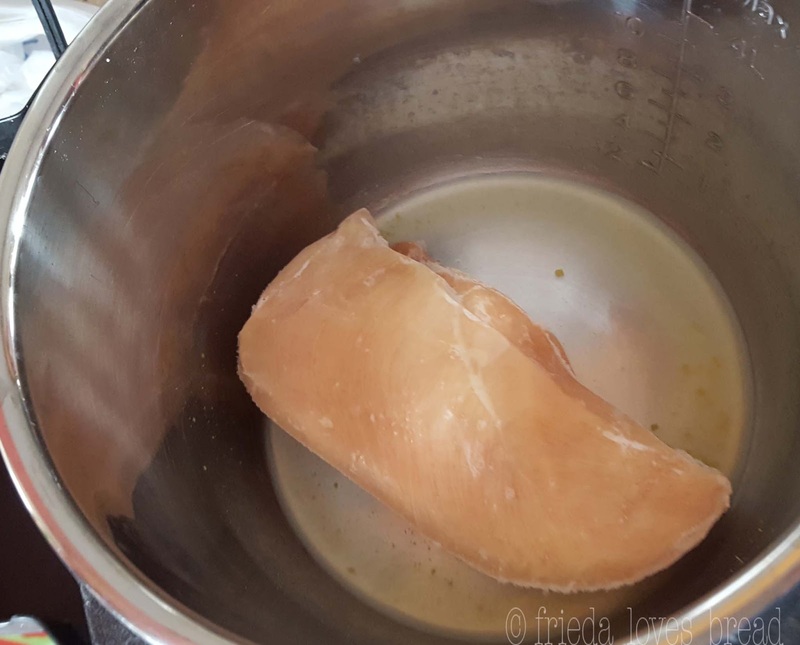 Place frozen chicken breast into pot.3. Close the lid and pressure valve. Select HIGH pressure, 1 minute per ounce. For 1 pound chicken breast, use 16 minutes for your cook time. If you are cooking more than one breast, use the average weight of the combined breasts as your cook time. Keep the chicken in a single layer or separate the chicken by using a tall trivet or criss-crossing the chicken at different angles.4. At the end of the cook time, set a timer for 10 minutes for the natural pressure release. (NPR)5. After 10 minutes, open the pressure valve to release any remaining pressure. Open the cooker and use an accurate thermometer inserted at the thickest part of the meat. Internal temperature should read at least 165°F. If the temperature is lower, close your cooker and wait another 5-10 minutes. The internal temp should rise 1 degree, every minute.6. Remove the chicken breast from the cooker, cut it into 2-3 chunks and put into a bowl of your electric stand mixer. Reserve the remaining liquid for another recipe as chicken broth.7. Using the flat blade attachment and the low speed setting for 10-15 seconds to shred your chicken to your desired texture.Your shredded chicken is now ready to use in any of your favorite recipes. Use in casseroles, quesadillas, pizza, burritos, pasta, salads, soups, or add your favorite BBQ sauce for a hot chicken sandwich. To Freeze: Put cooled chicken in freezer safe bags, roll the bag to remove the air, or use a Food Saver to prevent any freezer burn. If you add some of the reserved chicken broth, your chicken will stay more moist. Freeze for 4-6 months.